It somehow feels wrong to announce that I’m starting my memoir on the day I hear Carrie Fisher died… but also somehow right. Her character, the passionate champion Princess Leia, embodied so many of the qualities I’ve aspired to grow into. Her first few scenes on Endor highlight almost all of them. Her fierce determination during the speeder bike race. Her gentle ambassadorship with Wicket who invites her to the Ewok Village where she’s accepted as a guest. Finally, the way she balances compassion and answer-seeking when Luke comes out to her as Vader’s son. The range Carrie gave us in a few short scenes was masterful, and the depth of her character is rarely matched. I’d already chosen to start my book telling about the time I convinced all of the neighborhood kids it’d be a brilliant idea to re-create the Ewok Village in my yard’s crab-apple trees using two-by-fours and twine. Set aside your adult brain and see it from a child’s perspective. The crab-apple trees stood proud sentinel around the perimeter of the yard, much like the redwoods of Endor. To us, a two-by-four was more than wide enough to bridge the gap between trees. If you look closely at the Ewok Village in the film, it looks like MUCH of their dwelling is bound in some sort of twine anyway. We had everything we needed! And we were going to stomp the Empire right out of our neighborhood. I didn’t set out to be the leader… but it was my idea. And I was the oldest. (Well, technically the second oldest, but the oldest was too cool to play with us.) So I divided up the work based on what I knew my friends could do. To the young ones I gave the task of unspooling twine. I asked the older ones to hold the boards in place. The ones in the middle had the job of tying it all together. 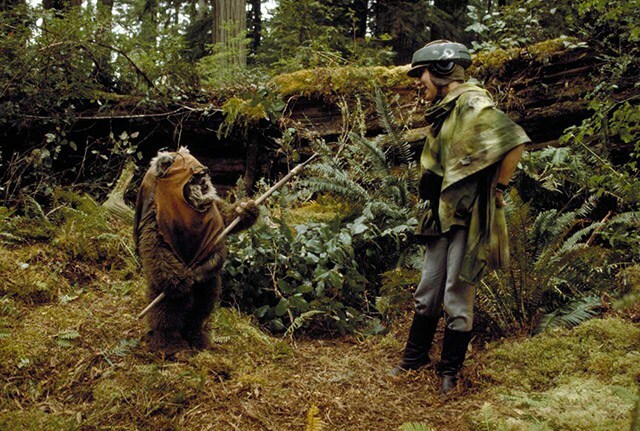 While working on our tasks we shouted to each other in what we though was the language of the Ewok laborers. It wasn’t long before I was shimmying out onto my first walkway. It was glorious! I was ready to fight the stormtroopers. My friends were swarming up their trees ready to do battle. I slithered forward another inch along my 2-x-4 walkway. “You kids get down from there before you kill yourselves!” shrieked the Emperor. My Ewok brethren dropped from their trees and ran! I looked over the fence, as I was hovering just above it now, eye-level with the neighbor who owned the yard behind us. The Emperor had traded his robes for fisherman’s pants and a short-sleeved checkered shirt… but he was no less dangerous. “I’m going to tell your father what you all were doing,” he threatened. Ok, I had a lot of growing to do… but the core was there. I owe you a lot, Carrie Fisher. Thank you.